All of the components of this solution that use AWS services are now in place. The last step is to create and deploy the web form that captures customer's data. In a text editor, create a new file. In the editor, paste the following code. // Function that parses URL parameters. // Get endpoint ID from URL parameter. 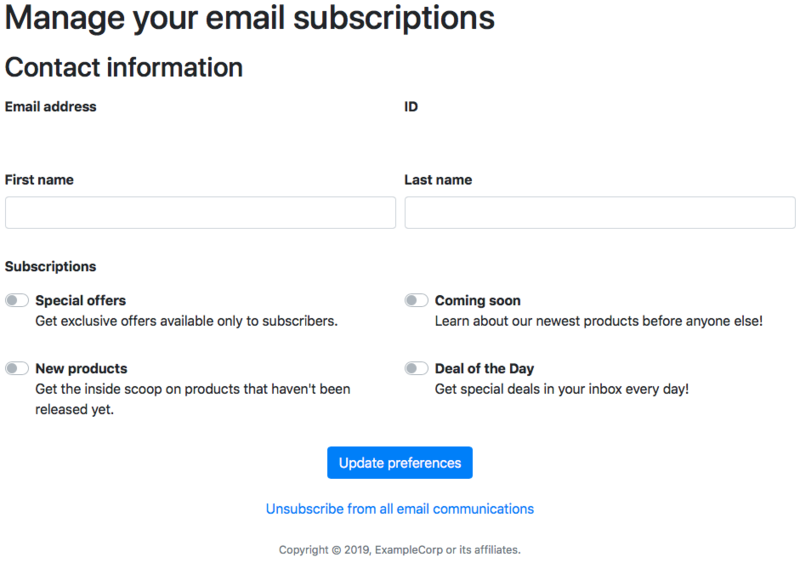 // Handle the case when the customer clicks the "Unsubscribe from all"
// Uncheck all boxes to give user a visual representation of the opt-out action. In the preceding example, replace https://example.execute-api.us-east-1.amazonaws.com/v1/prefs with the Invoke URL that you obtained in Step 5.3. When a user submits this form, it triggers a Lambda function that updates endpoints in your Amazon Pinpoint project. Malicious users could launch an attack on your form that could impact your data or cause a large number of requests to be made. If you plan to use this solution for a production use case, you should secure it by using a system such as Google reCAPTCHA. If you use another web hosting provider, consult the provider's documentation for more information about publishing webpages. After you publish the form, you should test it to confirm that it works properly. The first step in testing the preferences form is to use it to submit some test data. In this case, you opt in to all of the subscription topics that are listed on the form. In a web browser, go to the location where you uploaded the preferences page. If you used the code example from Step 6.2, you see a form that resembles the example in the following image. Add the following string to the end of the URL. Replace the values for firstName, lastName, and endpointId with the values that you specified in Step 2. When you add these attributes to the end of the URL and press Enter, the page updates to include the information in the attribute string. The form should resemble the example in the following image. On the form, use the toggle switches to opt the endpoint into all of the topics, and then choose Update preferences. Wait for approximately one minute, and then proceed to the next section. 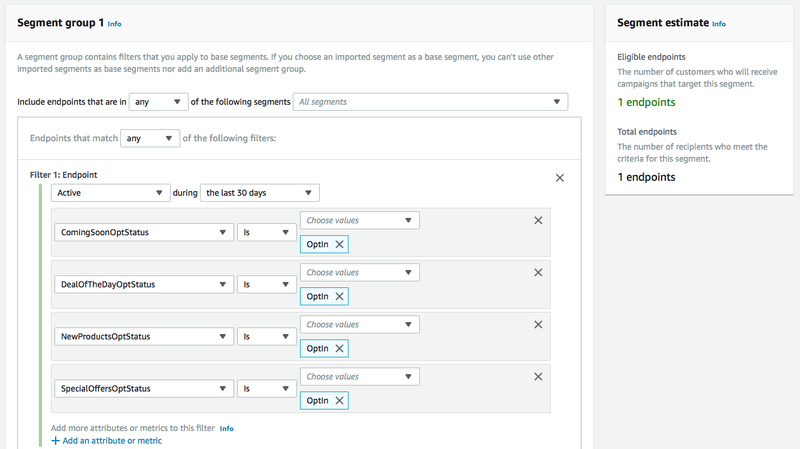 Now that you've submitted some test data, you can use the segmentation tool in the Amazon Pinpoint console to make sure that the test data was handled properly. In the navigation pane, choose Segments. Under Segment group 1, choose Add a filter, and then choose Filter by endpoint. Choose Choose an endpoint attribute, and then choose ComingSoonOptStatus. Set the value of the filter to OptIn. Choose Add an attribute or metric. Add the DealOfTheDay attribute to the filter, and set the value to OptIn. Repeat the previous step for the two remaining opt topics: NewProductsOptStatus and SpecialOffersOptStatus. When you finish, the Segment estimate section should indicate that the number of Eligible endpoints and Total endpoints are both 1. The page should resemble the example shown in the following image. Also make sure that the Unsubscribe from all email communications button on the preferences form works properly. When a customer chooses this button, their opt status for all topics is set to "OptOut". Additionally, the OptOut attribute for the customer's endpoint record is set to "ALL". This change prevents the endpoint from being included in segments that you create in this project in the future. In a web browser, go to the location where you uploaded the preferences page. When you add these attributes to the end of the URL and press Enter, the page updates to include the information in the attribute string. 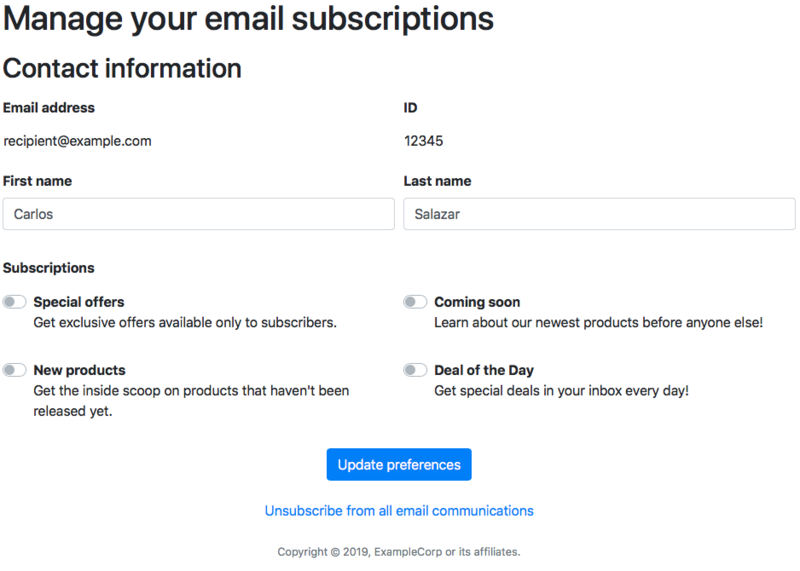 On the form, choose Unsubscribe from all email communications. The final step in testing the preference form is to confirm that unsubscribe requests are handled properly. In this section, you use the segmentation tool in the Amazon Pinpoint console to ensure that your test endpoint is opted out of email communications that are sent from the current Amazon Pinpoint project. Note the values in the Segment estimate section. This section should indicate that the number of Eligible endpoints is 0, and the number of Total endpoints is 1. The page should resemble the example shown in the following image. In the Amazon Pinpoint console, make sure that you're using the correct AWS Region. Segments and endpoints aren't shared between Regions. In the Lambda console, open the function that you created in Step 4. On the Monitoring tab, choose View logs in CloudWatch. Under Log Streams, choose the most recently logged event. Check the output of the event for more information about the issue. For example, if you see an "AccessDeniedException" error in the logs, make sure that the Amazon Pinpoint project ID and AWS Region that you entered in Step 4 are equal to the project ID and Region values that you specified in the IAM policy in Step 3.1. If you recently changed these values, wait for a few minutes, and then try again. If CloudWatch doesn't contain any logged information for the function, make sure that CORS is enabled in API Gateway, and that the API is deployed. If you're unsure, repeat the steps in Step 5.3.